← SHOCKER! Yes, this is poetry actually written by a 2020 POTUS candidate. (Reuters) – Large parts of Nebraska and the U.S. Central Plains were underwater on Saturday after a late-winter “bomb cyclone” storm triggered historic flooding along the Missouri and Platte rivers, causing two deaths, tearing apart homes and swallowing roadways. The National Weather Service predicted dangerous flooding would continue through the weekend in Nebraska and in south and west central Iowa, particularly along the Missouri River. “We’re still in a very widely dispersed and intense flooding situation in the eastern third of Nebraska,” said Mike Wight, a spokesman for the Nebraska Emergency Management Agency, in a phone interview. Nebraska has had two flood-related fatalities this week, Wight said. One person died at home after failing to evacuate, although the exact cause of death was unclear, authorities said, and the other was swept away while trying to tow a trapped car with his tractor. The flooding came in the wake of what meteorologists call a “bomb cyclone,” a winter hurricane that forms when the barometric pressure drops 24 millibars in 24 hours. The storm blew from the western Rockies to the Central Plains last week. 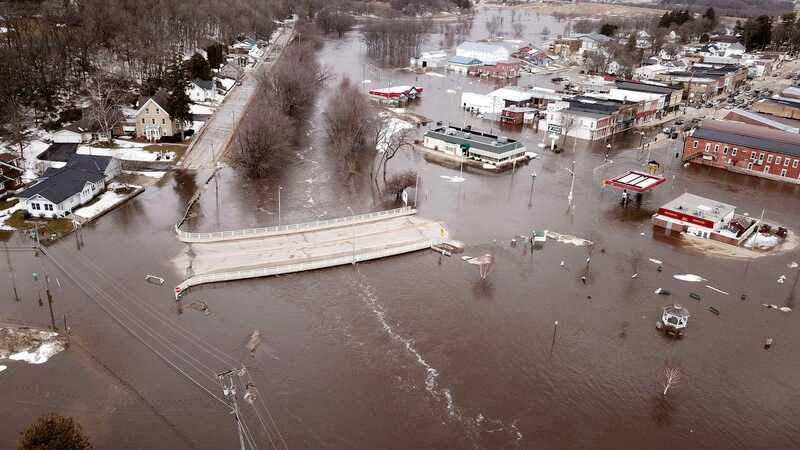 The rising water has reduced stores and homes to rubble and ripped off a long chunk of a highway bridge, according to photos posted on Twitter by Nebraska Governor Pete Ricketts. Ranchers posted images on social media of their cattle being dug out of snowdrifts or stranded in fields. The flooding has all but blocked access to some small communities along the river, where potable drinking water has become scarce as the flood has contaminated wells, Wight said. “The whole state is pulling together as we respond to and recover from the ongoing #NebraskaFlood! #NebraskaStrong,” the governor tweeted.